Ghylls are among the hidden gems of the Lakeland. Rarely are their delights brazenly shown, but coyly revealed at every twist and turn of the journey. They provide great sport, whether the ascent be wet or dry. The nature of the sport dictates that this is one activity in which the weather cannot dampen one's spirits. During your course we will tutor you in the art of canyoning, covering all aspects including: appropriate route selection, canyoning skills, weather interpretation, modern rope handling techniques, fixed belays, and abseiling. 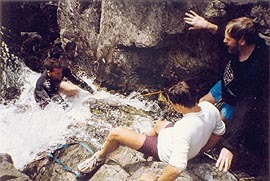 Go Higher's canyoning and ghyll scrambling courses are run exclusively in the Lake District through the year. Favourite outings include: Esk Gorge (pictured at right), Sour Milk Ghyll, Launchy Ghyll, Birker Falls, Crinkle Ghyll, Link Cove Beck. An ability to swim is desirable. transport to and from the crags. Remember that conditions can change rapidly in the hills, so always be prepared! Also check the conditions for your chosen course or holiday, as requirements vary. 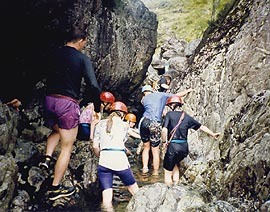 Canyoning in the spectacular Esk Gorge, Lake District. Photo © Steve Morgan, Go Higher. Topping out of the main falls in Esk Gorge, Lake District. Photo © Steve Morgan, Go Higher. [Inset Photo]: Start of the Esk Gorge. Photo © Steve Morgan, Go Higher.